Donnie Davidson turns off the lights in his dairy parlor. His family has been producing grade A milk in Holden, Mo., since the 1930s. Donnie Davidson decided to shut down his dairy in November after a roof on one of his barns collapsed from the winter’s snow. The roof would have cost $20,000 to rebuild. To keep going he also would have had to hire help and upgrade a silo for $25,000. 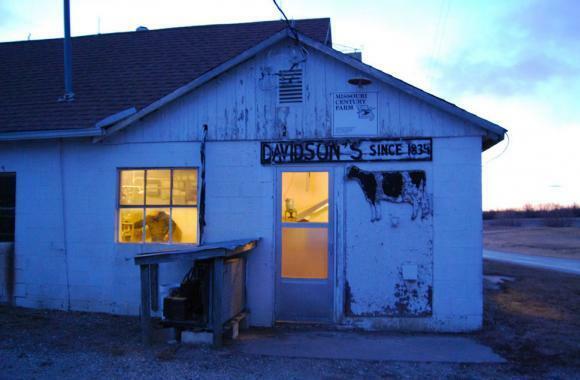 The last of Donnie Davidson’s dairy herd. 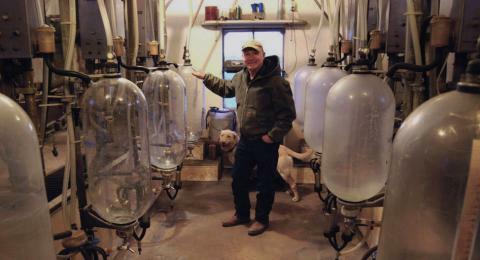 Donnie Davidson plans to sell the milking equipment in his parlor this spring. 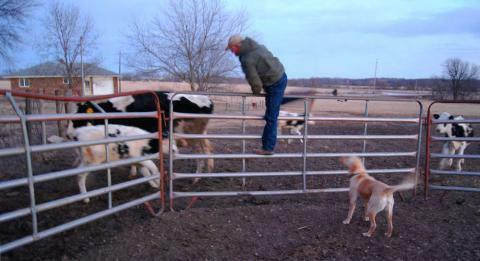 Instead of staying in the dairy business, he is building a beef herd and growing corn and soybeans. Tom Oelrichs milks 100 Holsteins at O-Rich Dairy in Mora, Mo., with his brother Randy and nephew Russ. To keep the dairy sustainable, the Oelrichs family grows 1,200 acres of corn and soybeans, and makes biodiesel from crushed soybeans. Hear the audio version of Abbie's story. The growth of the dairy industry across the High Plains has been a boon to the economy and communities of the region. Urbanization and increasing regulation in states such as California are often cited as the reason for the migration of large dairies to our area. But there’s also on overall industry consolidation underway that’s driving out small producers from nearby states, including dairyman Donnie Davidson and others in Missouri, as profiled in this story from Harvest Public Media. In the past decade, more than half the nation’s dairy farms have gone out of business, according to U.S. Department of Agriculture data. About 2,500 dairies closed their doors in Missouri. Thousands more have shut down in Iowa, Kentucky, Illinois, Indiana, Nebraska and Colorado. 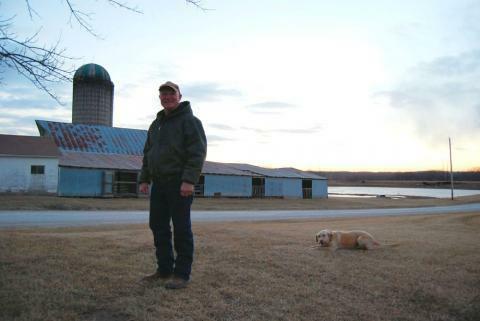 A decade ago, Harlan Borman’s farm was one of the last dairies left in Kingdom City, Mo. Then he and his wife Judy stopped milking cows in 2006 because they were getting older and did not want to rely on outside labor to keep the dairy running. Borman says he remembers when more than 30 dairies dotted the landscape of Calloway County, where they still raise cattle and grow crops. “About every other farm, every third farm, you'd see would be a dairy farm,” Harlan Borman said. Even as the number of dairies dwindles, milk production is rising. Thanks to advances like robotic milking and selective breeding, the industry is more efficient than ever. Dairies are producing 20 percent more milk than they did just ten years ago. But ramping up production is costly and often out of reach for some small dairies. Consolidation in the dairy industry is a national trend. In other states where dairies have been disappearing - like in Kansas, Iowa and Colorado – milk production has increased because large operations have moved in. Not so in Missouri, where production has fallen by 38 percent since 2000. 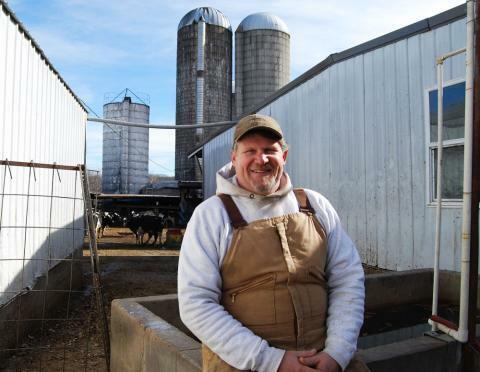 The challenges of running a sustainable dairy in a state with a shrinking number of dairy farmers are not lost on Tom Oelrichs, who milks about 100 Holsteins with his brother and nephew in Mora, Mo. “It's difficult because we've lost our infrastructure, our equipment dealers, because there aren't the people, the dairies, left for them to earn a living,” Oelrichs said. Oelrichs remembers the time when there was a bottling plant located nearby in Pettis County. Now the closest one is 60 miles away. Though fluid milk is perishable, it can travel substantial distances. But dairy farmers like Oelrichs have to pay the increased fuel costs for trucks to transport that milk. Oelrichs says he and other dairy farmers in Missouri may have to pass these costs onto consumers. If the state continues to lose milk production, it could also be harder to find local milk, ice cream, cheese and butter at the grocery store. Then there’s the larger economic impact of losing a $2 billion dairy industry for the state of Missouri, while across the border, Kansas lures big dairies and processing plants to set up shop. That’s why some states in the Midwest, including Kansas, Iowaand Colorado, offer incentives for home-grown dairies. But it could be too little, too late. Economists predict the global demand for dairy products will break records this year. And that will put more pressure on dairy farms to grow even larger and get even more milk from their operations.